In 1890 Peters Creek Mound was ‘excavated’ by amateurs in a single day. It contained two ‘skeletons’, two large copper plates and a number of other beautiful artifacts. It turns out the Mound tells two important stories. The first story deals with the copper trade from Upper Michigan across the Ocean to Europe, which lasted from the Fifth to the Twentieth Dynasty (2500-1200 BC). 60% of the copper was shipped along the Mississippi to the south, and 40% was brought via the St. Lawrence River to the east. A total of 24 million copper ingots were exported, including 2.4 million tin ingots (10%) from Bolivia. The second story deals with the Dardanus Flood in the Twentieth Dynasty. It was caused by a Comet Catastrophe, which lasted 40+40= 80 days. 3.8 million people perished, including 2.0 million men due to the chaos after it (32% of the world population). The total precipitation was c.5.5 meters of water. It happened during the reign of the 2nd king Ramses III (c.1159 BC). Peters Creek Mound was built at the end of the Twenty-fourth Dynasty. In 1890 Peters Creek Mound was ‘excavated’ by amateurs in a single day! What they found might be called quite remarkable. In the center and at ground level the scarce remains of two skeletons were found, their ‘faces’ covered by rectangular copper plates (Fig.1). The large copper plate was lying almost north and south, inclining to the west, and the small plate almost east and west, inclining to the north. The ‘skeletons’ must have lain in the same directions, but crossing each other. The large plate is 16.8" long by 8" wide (43x20 cm), and the small plate is 14" long by 6" wide (36x15 cm). Their thickness is the same, circa 0.13" (0.32 cm). Both plates have rounded corners, but the small plate is reel-shaped (quadri-concave). This plate is polished at both sides, but the larger plate is only polished at one side. Near both skeletons a large lump of red ochre was found, each weighing about 5 pounds (2.3 kg). Near the plates stone artifacts were found: a rectangular poll celt and two round poll celts, all three of comparable, normal size. A fully-grooved axe was clearly longer (Figs.2,3). Three small strips of folded copper were also found, as well as several large bear tusks, some of these covered with copper sheat, some with the copper sheat detached. Near the plates were found a hematite hemisphere, 60 disc shell beads, and three strings of large columnella beads, each 1.5" long by 0.75" wide (3.8x1.9 cm). A total of 28 of these drilled beads were recovered, which were made from the core of large seashells, such as are found on the shores of the Gulf of Mexico. Fig.1 The two copper plates of Peters Creek Mound. 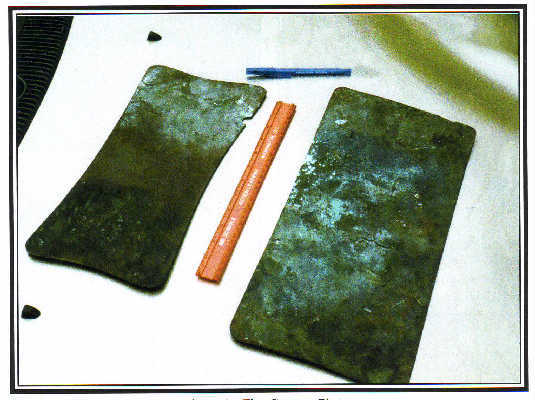 The two copper plates (and the other copper artifacts) indicate that Peters Creek Mound tells the story of the inter-continental copper trade. The two plates and the two skeletons each symbolize the start of the Twentieth Dynasty (c.1200 BC), when the copper trade ended. Each plate has two sides (front side and back side), twice confirming it. The two large lumps of red ochre confirm it. The two round poll celts confirm it. The two plates symbolize the latitude line at 20oN, halfway the latitude of the site (40o/2= 20oN), confirming it. The meridian or NS-line runs from Peters Creek Mound to the (northern) Ottawa Islands, at 40o + 20o = 60oN, and from the south coast of Lake Erie, at 40o + 2o= 42oN, to Mansel Island, at 42o + 20o = 62oN, twice confirming it. The complementary latitude at the mouth of the St. Lawrence River, at 90o - 40o = 50oN, just mentioned, is situated 50o - 30o = 20o above the Nile and Mississippi Delta’s, at 30oN, confirming the end of the copper trade at the start of the Twentieth Dynasty. It also shows the relative importance of the two copper trading routes in North America: a fraction of 3/5, or 60% of the copper was shipped from Upper Michigan along the Mississippi River to the Delta in the south, and a fraction of 2/5, or 40% of the copper was transported via the St. Lawrence Sea-way to the east.9-11 Note, that the large bear tusks, some covered with copper sheat, some with the copper sheat detached, illustrate the end of the copper trade. The larger copper plate and the first skeleton were lying almost north and south, inclining to the west, and the smaller plate and the second skeleton almost east and west, inclining to the north. So, the northwestern direction from Peters Creek Mound to Upper Michigan is emphasized. Each of the plates has 4 edges, twice encoding the direction from the site to Isle Royale in Lake Superior, 40o - 4o = 36oNNW. It also corresponds to Cape Hatteras, the East Cape of the US, and the Strait of Gibraltar, the entry of the Mediterranean Sea, both at 40o - 4o = 36oN. It symbolizes the circle angle of the planet Earth of 360o, and the circumference of the Earth of 36 Egyptian Moiras. It stresses the worldwide importance of the copper trade! The smaller copper plate has curved edges, indicating the curved latitude lines and curved meridians on the surface of the planet Earth. It confirms the long distance trade of the Michigan copper. Both plates have together 4+4= 8 edges, encoding Isle Royale in Lake Superior, 8o to the north, at 40o + 8o = 48oN. The meridian of Peters Creek Mound runs from Lake Erie, at 43oN, to James Bay, at 43o + 8o = 51oN, and from the coast of South Carolina, at 33oN, to the south tip of Florida, at 33o - 8o = 25oN, twice confirming this 8o distance in the NS direction. The south coast of Lake Erie, at 40o + 2o = 42oN, refers with its complementary latitude to Isle Royale, at 90o - 42o = 48oN. Isle Royale was the first source and primary symbol of the Michigan copper! Keweenaw Peninsula, at 47oN, is located 24o above the holy Tropic of Cancer along the north coast of Cuba, at 47o - 24o = 23oN, confirming it. It was the latitude of the Southern Egyptian Empire, and the center of the Sun religion. The Mound contained two copper plates and four important stone artifacts, confirming the total export across the Ocean of 20+4= 24 million copper ingots. The meridian runs from Peters Creek Mound to Southampton Island, at 40o + 24o = 64oN, and from the south coast of James Bay, at 51oN, to the east coast of Florida, at 51o - 24o = 27oN, and from the coast of South Carolina, at 33oN, over water to the isthmus of Panama, at 33o - 24o = 9oN, three times confirming the copper trade via the nine islands of the Azores. These nine islands refer to the density of copper, 9 g/cm3 (nine times heavier than water). The meridian runs from the south coast of Lake Erie, at 40o + 2o = 42oN to South Carolina, at 42o - 9o = 33oN, confirming it. Copper ingots with masses varying from 10 to 30 kg have been found by archaeologists. So, in order to calculate the export, we have to establish the mass of the Standard Ingot. Isle Royale is located 8o above Peters Creek Mound, and the complementary latitude of the Mound equals 90o - 40o = 50oN. It shows, the Standard Ingot had a mass of 80,000 carats (a number of five figures). For a long time past both noble metals, silver and gold, were weighed in units of carats, corresponding with 0.20 gram. The carat is the constant mass of a seed of the St. John’s bread or carob tree (Ceratonia siliqua). So, the mass of the Standard Ingot was 80x0.20= 16 kg (35 pounds). 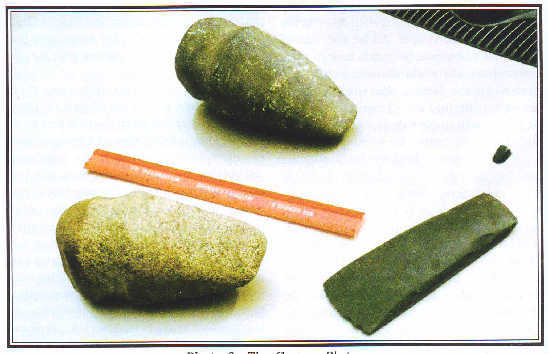 Fig.2 The rectangular poll celt at the right, and (maybe) the two round poll celts at the left. The two skeletons of Peters Creek Mound have two copper plates on their ‘faces’. So, the ceremonial Mound will tell at least a second important story. In the Twentieth Dynasty a major Flood happened, because of a cosmic collision of the planet Earth with the Tail of a Comet (or Comet Swarm). Peters Creek is symbolic for the Flood by this Comet, and the Monongahela River is symbolic for (the surface of) the Earth, which (already) contains a lot of water. In the Mound a hematite hemisphere was found. It symbolizes an earlier Comet Catastrophe in the Sixth Dynasty, at which half of the world population perished (c.2344 BC). The two skeletons and the two similar plates each show the Comet Catastrophe was a two stage event: it occurred during two equal time periods. Peters Creek Mound is located at 40oN. It symbolizes the first time period of 40 days when the Earth was inside the Tail of the Comet. The falling stones were causing horrible forest-fires, and the melting ice resulted in torrential rains and worldwide floodings. It was completely dark on Earth. The second time period also lasted 40 days. The climate was completely disrupted. The terrible rains continued, but it also became very cold. So, the rains changed into ferrocious snow and hail storms. Isle Royale is located 8° above Peters Creek Mound, confirming the total duration of the Catastrophe of 40+40= 80 days. Peters Creek Mound contains two copper plates and four important stone artifacts, confirming the 2.0+4.0= c.6.0 million casualties. It contains 60 disc shell beads, confirming it, too. Cape Hatteras and the Strait of Gibraltar are located 6° above the Nile and Mississippi Delta’s, at 30+6= 36°N, confirming it, again. This latitude is symbolic for the circumference of the planet Earth of 36 Egyptian Moiras. It shows it was a worldwide Catastrophe! It ended all ancient civilizations on Earth, including the New Kingdom of Egypt. Isle Royale is located 48o - 30o = 18o above the Mississippi Delta, encoding the original world population of 18 million men before the Disaster (a number of 8 figures). It is located 48o - 36o = 12o above Cape Hatteras, corresponding to the 12 million survivors, worldwide. Many of them were seriously injured. The meridian of Peters Creek Mound runs to the coast of South Carolina, at 33oN, confirming the total number of 18 - 12 = 6 million casualties, which is (6/18) x100= 33% of the world population. The complementary latitude of 90o - 33o = 57oN encodes the periodicity of this historical Comet, c.570 years (a number of 3 figures). The south point of the Gulf of Campeche, Mexico, is located at 18oN. It was the center of civilization in Central America, also known as the Realm of the Dead in the west (Punt). It confirms the original world population of 18 million men. It is situated 30o - 18o = 12o below the Mississippi Delta, confirming the 12 million survivors. 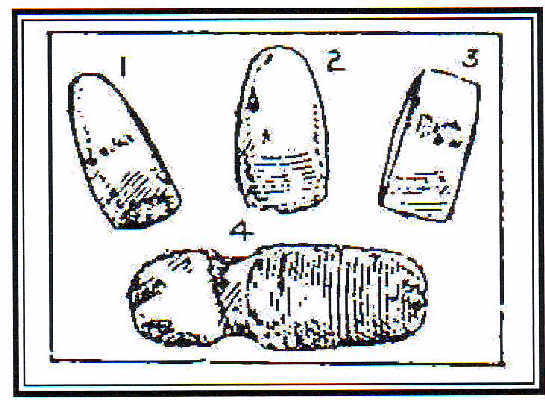 Fig.3 The four stone artifacts found in Peters Creek Mound. During the copper trade America was a colony of Egypt (Atlantis). Dating of monuments was accomplished by dynasty and kings encodings (Adena). After the Twentieth Dynasty America became independent. However, it appears the usual way of dating continued (Hopewell). So, dating the Mound may be done by studying Egyptian history. One should realize that a mound is the oldest form of a king’s grave. The large copper plate has a length/width ratio of 2.2, which might refer to the Twenty-second Dynasty. Isle Royale is located 8o above Peters Creek Mound, which corresponds to its 8 kings. So, it appears the Mound was erected at a later date. These 28 columnella beads also encode the date of the Comet Catastrophe, 28 years after the start of the Twentieth Dynasty, which is in 1186-28= c.1158 BC. This date was remembered during the reign of king Osorkon III, 400 years later, in 1158-400= c.758 BC. These 400 years correspond to the latitude of Peters Creek Mound, at 40oN. So, it appears the Mound was erected just after the Twenty-third Dynasty. The small copper plate has a length/width ratio of 2.4, which refers to the Twenty-fourth Dynasty (c.727-715 BC). This number confirms the total export across the Ocean: 24 million copper ingots! The two copper plates in the Mound confirm the 24/2= 12 million survivors of the Flood! This number also agrees with the duration of this Dynasty: 12 years. So, Peters Creek Mound was erected at the end of the Twenty-fourth Dynasty, in c.715 BC. 1. Gallant, L.C., "The Copper Plates from Peters Creek", Ancient American, Vol.14, No.88, pgs.12-16 (2010). 2. Grondine, E.P., Man and Impact in the Americas, Kempton, Illinois (2005) (ISBN 0-9776- 152-0-0). 5. De Jonge, R.M., and Wakefield, J.S., "The Discovery of the Atlantic Islands", Ancient American, Vol.13, No.81, pgs.18-25 (2008). 7. De Jonge, R.M., "The Discovery of Three Continents (Santo Stefano, North Sardinia, Italy, c.2300 BC)", Ancient American, Vol.12, No.76, pgs.28-29 (2007), Ref.6. 9. De Jonge, R.M., "Houghton’s Petroglyph (Copper Country, Michigan, 2500-1200 BC)", Ref.6, to be published. 10. De Jonge, R.M., "The Mystic Symbol, mark of the Michigan Mound Builders", Ref.6, to be published. 11. De Jonge, R.M., "Cahokia, Capital of Ancient America", Ref.6, to be published. 12. Rydholm, C.F., Michigan Copper, The Untold Story, Winter Cabin Books, Marquette, 2006 (ISBN 0-9744679-2-8). 13. De Jonge, R.M., The Phaistos Disc Decoded, New Testimony of a Lost Civilization, Midwestern Epigraphic Journal, Vol.20, 111-115 (2006), and Vol.21, 74-80 (2007), to be published. 14. De Jonge, R.M., "The Battersea Shield (River Thames, London, c.190 BC)", Ref.6, to be published. 15. De Jonge, R.M., "Copper Trade with the Old World (Poverty Point, NE Louisiana)", Ref.6, to be published. 16. De Jonge, R.M., "Petroglyph of a Sailing Boat (Copper Harbor, Upper Michigan, c.1640 BC)", Ref.6, to be published. 17. Peiser, B.J., Palmer, T., Bailey, M.E., Natural Catastrophes during Bronze Age Civilizations, BAR International Series 728, Oxford, 1998 (ISBN 0-86054-916-X). 18. Clube, S.V.M., and Napier, W.M., The Cosmic Winter, Blackwell, Oxford, 1990. 19. Joseph, F., Survivors of Atlantis, Their Impact on World Culture, Bear & Co., Vermont 2004 (ISBN 1-59143-0-040-2). 20. Baillie, M., Exodus to Arthur, Catastrophic Encounters with Comets, BT Batsford Ltd., London, 1999 (ISBN 0-7134-8681-3). 22. De Jonge, R.M., "Discovery of America and the Flood (c.2300 BC, Ita Letra, Villarrica, Paraguay)", Ref.6, to be published. 23. De Jonge, R.M., "The Brandenburg Stone, Comet Catastrophe of 536/540 AD" (560 AD, Battletown, Meade County, Kentucky), Ref.6, to be published. 24. De Jonge, R.M., "About the Brandenburg Stone (560 AD, Battletown, Meade County, Kentucky)", Ref.6, to be published. 25. De Jonge, R.M., "The Myths of Monks Mound (Cahokia, Illinois, 650-1400 AD)", Ref.6, to be published. 26. De Jonge, R.M., "Ikom and the Dardanus Flood (c.1159 BC, Cross River State, Nigeria)", Ref.6, to be published. 27. De Jonge, R.M., "Great Serpent Mound (c.2300 BC, Adams County, Ohio)", Ref.6, to be published.